Al Kalima Editorial Committee—which includes Wycliffe/SIL and Frontiers USA members—has been trying to weather mounting criticisms over mistranslations in The True Meaning of the Gospel of Christ. It has gone as far as claiming the translation “was produced in classical Arabic.” Al Kalima also claims The True Meaning is in “Standard [sic] Arabic.” These statements do not add up. Classical Arabic and standard Arabic are not the same but this contradiction is trivial compared with some of its bold claims. I have some serious concerns about Al Kalima’s rationale behind translating “Father” as the issue is not linguistics in nature but theological. When I read through Al Kalima Responses to Adam Simnowitz’s Criticisms, I was particularly interested in Islamic sources the committee had used to make the case for substituting “Allah” (“God” in Arabic) for “Father.” By the way, I am not opposed to translating “God” as “Allah” in Arabic translations. First error: This phrase “Bismillah Rabbil Alamin” is not in the Qur’an. Al Kalima committee seems to know so much Arabic and Islam and boasts of rendering The True Meaning in classical Arabic yet it could not even catch how this post misquotes the first verse of the Qur’an. A devout Muslim recites this verse at least 17 times a day. Second error: Even if this post had quoted the first Qur’an verse correctly, the interpretation is wrong because orthodox Muslims do not interpret “Allah” or “Rabbi” as “Father.” I had thought Wycliffe/SIL and Frontiers USA were coming up with this translation to reach practicing Muslims. Shouldn’t they at least have chosen orthodox Muslims’ interpretation? 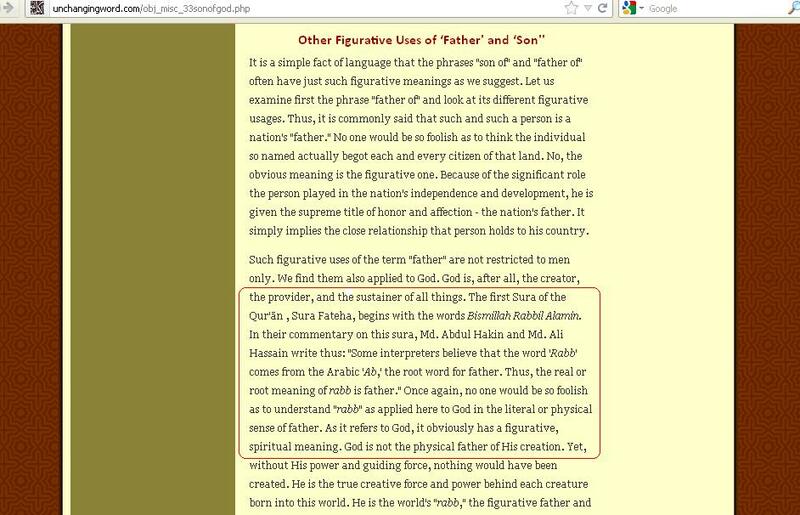 Surprises: What is equally telling, first, the quote about the Arabic argument for Allah as “Father” only appears online in one other place and it is on a website run by proponents of Insider Movement. Second, the Islamic scholar quoted belonged to Ahmadiyya, which is a sect orthodox Muslims consider heretical and even kill its adherents especially in Pakistan and Indonesia. It has “tens of millions” of members worldwide. Al Kalima quotes a Muslim who was not a scholar of Islam but someone who was just trying to respond to Christian missionaries early in the 20th century. He was a Pakistani not an Arab, and reputable Christian organizations are now using his expertise in Arabic and Islam—while totally ignoring other Arab Christians (Lebanese, Saudis, Iraqis, etc)—to change God’s infallible Word. [T]he translation team decided in May 2011 to proceed with a complete revision of the Gospels and Acts on the basis of friendly user feedback and insights gained while translating the New Testament epistles. The plan is to regularize the usage so that the Arabic translation is concordant with regard to key terms, in order to provide transparency and clarity about which Arabic terms represent which Greek ones. This will include the consistent use of al-wali for the Father. In addition, the articles and footnotes will be revised to incorporate the latest insights. This will be done with the input of approved Bible translation consultants, Arab specialists in Arabic, and Bible scholars, both Arab Bible scholars and others. However, Simnowitz’s critiques are laced with significant errors and misrepresentations of The True Meaning, the Arabic language, and Muslim culture and practices. We believe it would be best for him to withdraw these documents and consider presenting criticisms that are valid and well-meaning. The Church of Jesus Christ should be thankful for Adam Simnowitz. Had it not been for his efforts, Wycliffe, SIL, Frontiers USA and Al Kalima wouldn’t have slowed down. Please, keep on putting pressure on these organizations until all these mistranslations of Scripture that are in print are destroyed and the project scrapped. There are already about a dozen modern Arabic translations of the Bible. Why are these organizations wasting their resources—Frontiers USA spent $214,900 through 2009 on this project—when “about 350 million people” worldwide do not have any portion of Scripture in their languages? 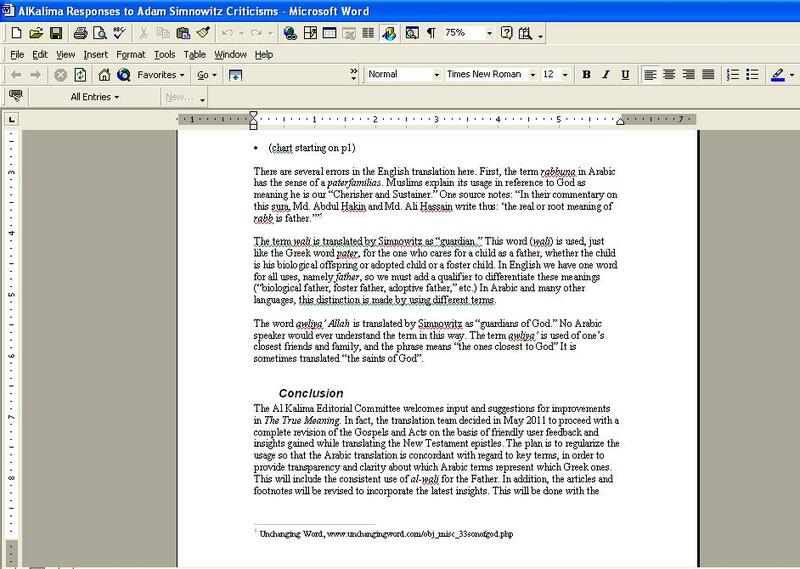 Al Kalima Editorial Committee, Responses to Adam Simnowitz’s Critique Of Familial Terms in The True Meaning, January 13, 2012.